WR-200 serves the practical and quick way for users who is used to wire binding and punching. 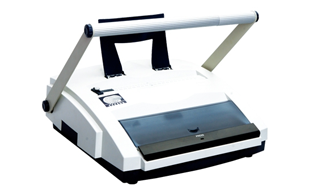 The WR-200 multi-functional wire binding machine has a single handle designed for both punching and binding. Equipped with 2 blades for both 2:1 (23 holes) and 3:1 (34 holes) manual punching. Features include a gauge designed for measuring the size of wire, a micro-adjust wire closer and a unique design for wire hanging. Contact us to see how this Binding Machine can help your business!